“Grandma’s Attic”~What secret has Grandma been hiding? Uncover the pieces and your family history! 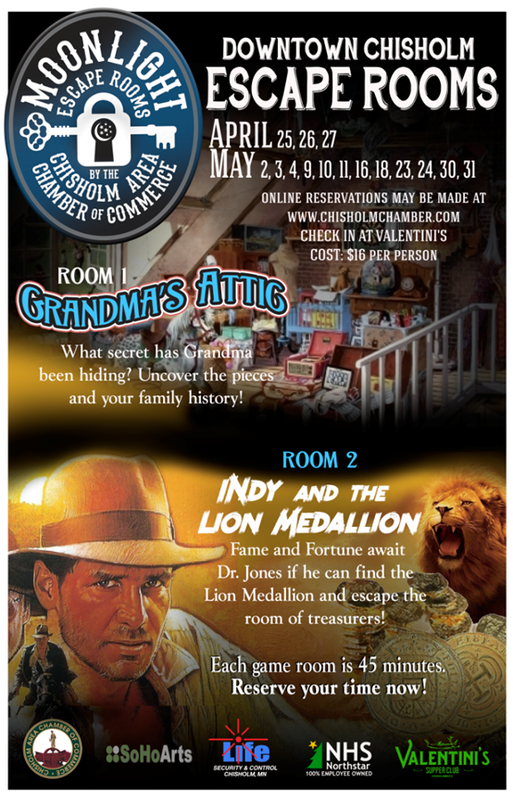 “Indy and the Lion Medallion”~ Fame and Fortune await Dr. Jones if he can find the Lion Medallion and escape the room of gold! Players are locked in a room where they must find clues and solve puzzles tied to the room’s theme to escape before the time runs out. 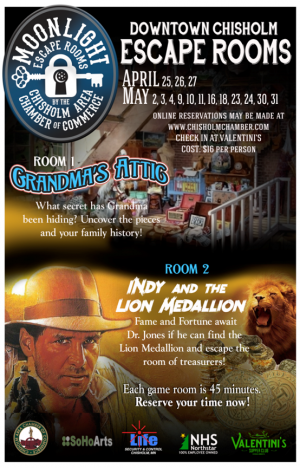 Adrenaline and intrigue fueled, escape rooms replace the typical activities done with friends and family with something new, exciting and fun. Escape rooms give players the thrill and pressure that they so often see on television and in movies. These games pull you into a world where problem-solving and teamwork are key and you start to understand how the likes of Indiana Jones and Sherlock Holmes might feel. Experience the craze that is sweeping the country and test your skills in these two challengingly fun rooms! Choose a room and reserve your time now. Groups should check in at Valentini’s Supper Club, 31 W Lake Street, Downtown Chisholm. Refunds must be requested 72 hours prior to your reservation time to be considered, credit card fees will apply. “Polar Bear Days” FESTIVAL BINGO!